I'm so excited to get started on this year's Fall Into Reading Challenge hosted by Katrina at Callapidder Days. This will be my third year participating, and it's always such a great motivation for reading the books on my shelf. This is the challenge that drew me into the book blogging world two years ago. This year, I'm even more excited because I'm focusing more on my own books and less on review book obligations. So here is the list of books I'm hoping to read between today and December 21st. I'm signed up for THREE read-a-thons in October (see my sidebar), so I hope that will help me get through this list and possibly read even more. I'll keep this page updated with my progress and links to reviews as I post them. Sweet dates in Basra has been on my TBR shelf in awhile. I'll be interested to see how you like it! My list is here. Great list of books! The Book Thief and Fahrenheit 451 are both books I'd love to read at some point - good luck with your challenge! Hotel on the Corner of Bitter and Sweet and The Forgotten Garden are on my list also. I've seen The Book Thief listed a couple of times so far. I need to check on this one. Good luck with your list and happy reading! I loved The Forgotten Garden...such a great book. I picked up the author's other books as well and can't wait to read them. My list is a combo of review books and books that will help me complete the other reading challenges I am participating in. Three readathons...go girl! I've scaled back on review books too. Infidel is such a good book. Good luck with the challenge! Great list, Julie! You have several that I've read and really enjoyed -- Book Thief, Forgotten Garden, Hotel on the Corner... Great picks! And it looks like you'll have some good variety this fall. Thanks for being part of FIR '11! Wow, an impressive list! You should have a great fall with all those wonderful books! So, what's this challenge? You just choose any books you want and pledge to read them this season? You know, I'm usually pretty wary of adding any new commitments, but this sounds very flexible. The Forgotten Garden was just given to me. I've read good reviews for it. 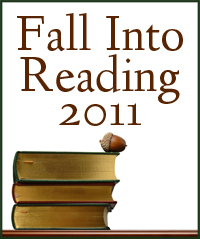 Have a great fall of reading. You inspired me, Julie! I signed up for Fall Into Reading this weekend for both of my blogs, making it my second challenge ever (I'm also doing Where Are You Reading which also requires no extra commitment!). Looks like fun, plus, I really liked Callpidder Days blog, so thanks for leading me to that one also. I loved The Forgotten Garden and Hotel on the Corner of Bitter and Sweet. But, The Book Thief is incredible. The rest of your list looks good too! Happy Reading! My sister just read The Book Thief and liked it. Great list!! !